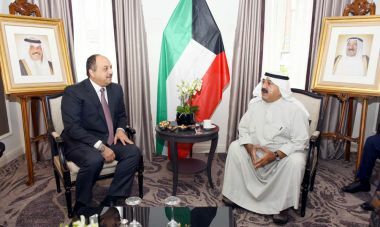 BRUSSELS-- Kuwait's First Deputy Premier and Defense Minister Sheikh Nasser Sabah Al-Ahmad Al-Sabah held met in Brussels Friday with Qatari Minister of State for Defense Affairs Dr. Khaled Al-Attiyah. The two men discussed military cooperation between the two countries as well as issues of mutual interest. Sheikh Nasser also met with US Defense Secretary James Mattis and means of cementing military collaboration between Kuwait and Washington. Sheikh Nasser met with British Defense Secretary Gavin Williamson in Brussels today, and discussed military issues of mutual interest. The Kuwaiti senior official also met with NATO Secretary General Jens Stoltenberg and discussed cooperation between the two sides. Sheikh Nasser said in a statement later the meetings were part of collective military cooperation and coordination to achieve common objectives.